Fluoride Action Network | India’s water woes: Could special ATMs solve the lack of clean drinking water? Tap water in India isn’t always clean; people often have to turn to bottled drinking water instead. But that’s too expensive for poorer communities. Social entrepreneurs are stepping in with an unusual solution. The families living at the edge of the Bhalswa landfill site in Delhi came to the capital from West Bengal in search of a better livelihood. Their makeshift and brick houses press up against a soaring pile of garbage. Each day, they climb “trash mountain,” as the 30-meter (99 foot) landfill is known, to salvage waste they can resell. Most families earn between 100 rupees ($ 1.45, €1.28) to 400 rupees ($5.79, €5.11) per day. Life is hard. And from the little money they make, they must buy their own bottled drinking water, because they don’t have access to clean drinking water. “There’s a big problem with water. There are no roads or drains, (dirty) water enters our homes,” said Latipha Bibi, one of the waste pickers. About 30 families get their water from the same tap. It provides water for two to three hours each day, but the waste pickers say contaminants from the nearby dump seep into the pipes and it takes a long time to flush those out, so the community is usually only left with about 30 minutes of clean water a day. Water contamination is a problem in most of India. Excess arsenic, fluoride and heavy metals taint the groundwater across a country that relies on this source for 80 percent of its domestic water supply, according to the World Bank. And climate change is making matters worse. Irregular weather patterns and drought mean groundwater pumped for farming and domestic use isn’t always replenished. At the same time, rising seas are contaminating freshwater lakes and rivers with saline, leaving them undrinkable. Some 1,700 kilometers (1056.3 miles) from Bhalswa, villagers in Mangamaripeta on the Bay of Bengal are witnessing the Indian Ocean rising around them, and seeping into their groundwater. Like the waste pickers in Bhalswa, many villagers rely on bottled water for drinking and cooking, costing a family up to 30 rupees per day. But that’s more than some can afford, meaning they must drink the municipal water they say is contaminated. Across India, people don’t trust the water coming out of their taps. The bottled water market grew 184 percent between 2012 and 2017, market research firm Euromonitor found. The Indian government has promised to provide drinkable water for every family in the country by 2022. But many doubt it will be able to fulfill its promise. In the meantime, startups and social enterprises — some with government funding — are offering cheaper alternatives to bottled water. In the last decade, thousands of “water ATMs” — vending machines where people can collect water in their own containers at low prices — have popped up across the country. Some companies refill these ATMs from trucks, but others, like startup Swajal, pump water from the ground and rivers and purify it. “I belong to a small village in Uttar Pradesh and water is a problem there,” said Vibha Tripathi, Swajal’s managing director. Tripathi became concerned about India’s water issues after her two-year-old cousin died from diarrhea. In India, diarrhea is the third most common cause of death in children. Since Swajal’s launch in 2014, Tripathi and her team have set up around 400 water ATMs across the country. The company charges more for water in cities, cutting prices in villages where communities don’t earn as much. In cities, one liter costs around one rupee. In villages, Swajal charges about half that. Tripathi says the government doesn’t have the capacity to reach the hundreds of millions of people facing water problems. For example, in the case of Bhalswa, the single tap supplies clean water for just 30 minutes because the pipeline is not maintained. And the tap was only built after months of requests from the community. The infrastructure will come, believes Tripathi, but in the meantime, she says businesses like hers can bring clean water to communities that would otherwise go without. The Indian government estimates the market for water and wastewater treatment is worth $420 million, and it’s growing fast. Still, it can take many years for a company to recover costs on one ATM. ATMs and other solutions, such as low-cost home tap-water filters, are cheaper than bottled water in the long run. Still, poor communities are paying far more for water than they would if the public supply was clean and safe. Even where water startups are stepping in to fill the gap, they haven’t grown fast enough to reach the hundreds of millions of people living under the poverty line in India. 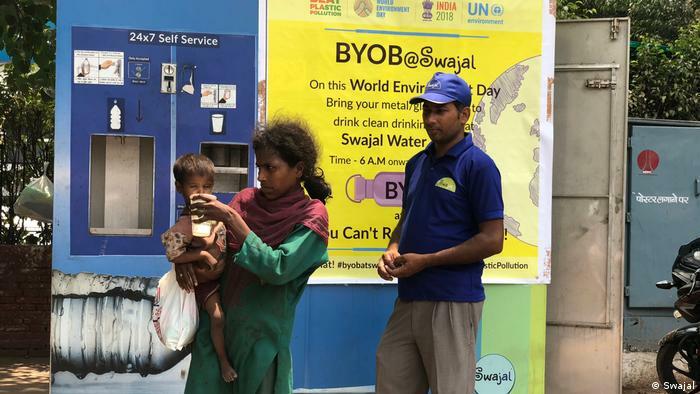 By the end of this year, Swajal wants to set up a thousand water ATMs across the country. But Bhalswa is not a priority right now. For now, the only option for the community there is to keep lobbying for improvement — and while people in Bhalswa have heard of the ATMs, they would prefer for the government to step in. “We’ve gone to our government representative 15 or 20 times to demand for a tap (with clean water supply),” says Bhalswa resident Saira Banu. Banu says she boils water for washing but even then it isn’t safe to drink, so she is still forced to buy drinking water. According to NGO worker Chaurasia, the government has promised to build a water filtration plant to serve the communities living near Bhalswa after 2019. But with the 2019 general elections just around the corner, it’s not clear if the current government will still be there to complete these projects, leaving Bhalswa in a state of uncertainty. “(The current local government representative) said it will happen slowly. But when it will happen or how it will happen, we don’t know,” said Banu. *DW reached out multiple times to the Ministry of Water Resources, River Development & Ganga Rejuvenation, the Central Ground Water Board and the Delhi Pollution Control Committee for comment but had not received a response by the time of publication.